It’s certainly no secret that higher education globally is under going significant change. While it’s always difficult to have clear perspective when one is in the middle of a shift or period of dynamism, I believe this change is more profound than any we’ve seen in our lifetimes as higher education professionals, but I will also say that the change yet to come in the next 5-10 years is likely to be even more significant. Technology is underpinning a lot of these changes, but questions of culture, tradition, and historical precedent are being considered alongside discussions of the overall cost of education, the “return on investment,” student experience, and what truly defines “institutional excellence,” all questions that we hope to address at some stage during our upcoming participation in the Ovum Future EdTech conference in London. All of us have been exposed to extremist predictions of massive reductions in the number of higher education institutions as a result of financial pressures and declining enrollment; the advent of MOOC’s (massive open online courses) and their purported ability to essentially replace the traditional model of delivering education content; the rapid ascent (and subsequent decline) of certain for-profit models of education; and in technology circles how everything “cloud” will allegedly solve all of our problems, financial as well as technical, and “solve world hunger” at the same time. But lost in a lot of this hyperbole are a number of nuggets of positive change that have come from some of the forces I’ve just outlined. We’ve seen significant improvements in the delivery of education content through flipped classrooms and blended learning environments. MOOC’s haven’t replaced the traditional models of delivering education but they have had a positive influence on how students can be more effectively engaged and can learn at their own pace, while advances in technology have made on-line learning very interactive and engaging versus the passive models of the past. In the “back office” of higher education, there has been significant pressure to drive operational efficiencies because of the draw-down over the past decade in public funding support for education, and as a result, albeit slowly, higher education has begun to adopt modern and more standard business processes in areas where bespoke process does not contribute significantly to the overall mission of teaching, learning and research. Furthermore because of the increased expectations around the “return on investment” in education, since more and more of the cost is being shouldered by the student and parent, more focus and emphasis is being placed on the overall student experience. Underpinning all of this is a statistic I’d like to cite that comes from a survey conducted in the US annually by Casey Green of the Campus Computing Project that points to executive leadership (Vice Chancellors, Presidents, Provosts, etc.) of most institutions being significantly less sanguine about the effectiveness of IT investments in advancing the overall mission of the institutions versus their IT staff. In some cases this gap is as large as 20% in terms of those that rate these investments as “very effective” versus those that do not. This either speaks to unrealistic expectations, a failure to effectively communicate, or some other issue that perhaps we can explore during the upcoming Ovum Future EdTech conference. One topic that I hope to address when I speak to the conference attendees during our session “Cloud Forecast: For Once A Very Promising Outlook” surrounds the larger general conversation in the higher education (and indeed across the entire education) sector that is quite prevalent: the general recognition that higher education is in need of significant change (transformation) – such as how education is delivered, how classrooms are organised, how information technology is leveraged, delivered, consumed, etc. but it always comes back to how do we change the culture of higher education to support or enable true transformation – new ways of thinking, new business models and revenue sources, non-traditional programmes, competency based education models, mostly on-line programmes, etc. – I hope to offer some ideas on the aforementioned points, and of course discuss how this cultural change is needed in order to extract maximum value from technology investments in the coming years. Oracle Higher Education Cloud – Modern Campus. Modern Platform. Oracle is our Mission Critical Sponsor at Future EdTech, taking place on the 2nd – 3rd June 2015 at Millenium Gloucester Hotel in London – the first and only event in Europe enabling transformational change and innovation in higher education via technology. 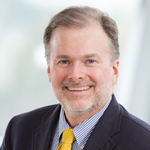 Join Cole Clark, Global Vice President, Education & Research at Oracle, for his session Cloud Forecast: For Once A Very Promising Outlook at 9:40am, Wednesday, 3rd June. Please also visit the exhibition stand to find out more. Supporting new business models, recruiting top talent, architecting more efficient business processes, and delivering personalised student experiences are top-of-mind-issues for campus leaders everywhere. And with competition heating up, colleges and universities are under tremendous pressure to transform their campuses to meet the demands of modern students, faculty, and staff. To address these challenges, campus leaders are looking to innovate with cloud technologies that help them modernise their systems and processes and transform to a Modern Campus. Oracle are proud to be the Mission Critical Sponsor of the Future Edtech Conference and Exhibition taking place at the Millennium Gloucester Hotel in London, 2 – 3 June 2015 – the first and only event in Europe enabling transformational change and innovation in higher education via technology. Held in partnership with Ovum’s Future EdTech Conference, this complimentary webinar is now available for download. Nicole Engelbert (Director, Research & Analysis, Industries, Ovum) presents this insightful 30 minute Webinar on “How to successfully integrate ICT into institutional strategy and decision-making to deliver transformational change”. Hear how to empower your institution to be more flexible and agile in the delivery of services and academic programs, accelerating the pace of innovation and ultimately improving its standing. Download your FREE Webinar here. Social Data: It’s always useful to know some statistics when it comes to learning about social media. I’m a big fan of the Social Media Update from the Pew Research Center. Strategic Communications and The Business of Social Media: Digital Communications 101 knowledge, for student affairs work or a business, can be enhanced by checking out these 8 communications resources. Digital Accessibility: There is so much work that needs to be done to ramp up the overall state of social media accessibility. I would start with learning how to caption/subtitle YouTube videos. Social Media Metrics: What does success mean in the digital realm? Are you looking for likes, followers, engagement, mentions, page views, etc? Note to self, write up a post in the future on social media metrics. For now, try to avoid vanity metricsand definitely visit Matt Hames’ posts on LinkedIn for some quality writing on digital data. Social Media Sites & Apps: You’ll never stop learning in the social media arena. Developers keep iterating/creating and audiences shift over time. Digital Professional Development: Connecting with peers, colleagues, mentors, friends, brands, schools, etc. is a wonderful way to keep informed, ask questions, and grow as a professional. My favorite method is the ubiquitous hashtag on Twitter. Blogs: I would be remiss if I didn’t include blogs in this list. As digital hubs, content repositories, and engagement platforms, blogs are almost as relevant in 2015 as they were more than a decade ago. Social Listening: Using social media for engagement is a terrific facet of the various sites/apps that represent the social sphere. However, you can use social media to “listen” for campus themes which can be useful for all sorts of educational initiatives. Digital Enrollment Management: Needless to say, strategic enrollment management professionals understand the value of strategic social media communications. Career Development / Digital Identity: Working on establishing a digital presence requires thoughtfulness and fluency. This section could probably be an entire course just by itself. Digital Advising/Engagement: Learning tips on how to advise and engage via social media seems like an obvious section in an educational landscape that is made up of a variety of learners. For online-only students, social media and digital communications are going to be instrumental in advising, retaining, and supporting individuals who you may never see in-person. Join the Future EdTech Event taking place in London on 2-3 June 2015. 250+ delegates and 50+ speakers will come together at Future EdTech 2015! 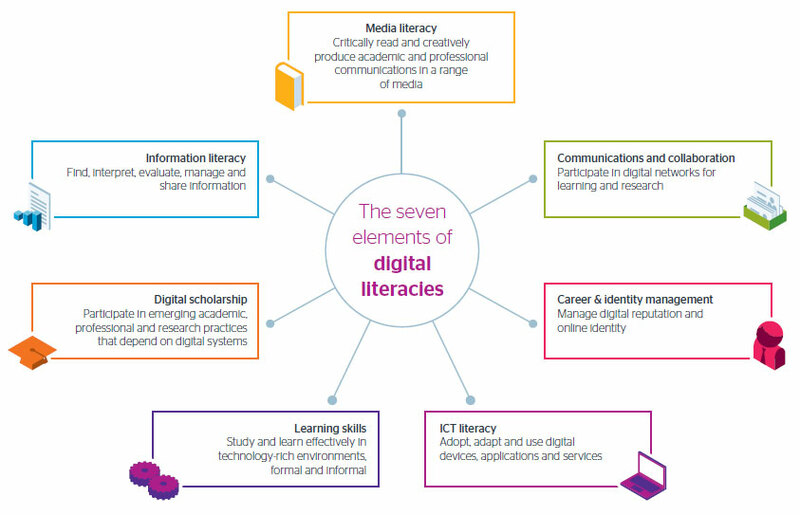 The seven elements of digital literacies model from Jisc represents a useful visual/model for those of us who teach, speak, and write about all things digital. When you think broadly about each of the 7 elements, connections can be made that resonate with student affairs work. The section on communications and collaboration is especially relevant for those of us who work to enhance student engagement and create opportunities for digital community. The career and identity management element matches up perfectly to the concept of digital identity. When students transition into higher education it is often the case that their digital identity will also be in a state of transition. Career services and orientation programs are in the perfect spot for providing educational efforts on digital identity. Information and communication technology (ICT) is perhaps the largest element in the model in terms of overall evolution and flux. Digital devices, applications, and services seem to change on a daily basis as “new” and “shiny” tend to dominate the news cycle. This is the digital literacy element that requires a good amount of experimentation, discovery, and dissonance. Speaking of digital literacy/identity resources, a fantastic complement to the Jisc digital literacies model is David White‘s work on “visitors and residents.” Breaking free from the all-too-rigid digital native/immigrant narrative, White writes about a “continuum of ‘modes of engagement'” that embraces nuance and varying levels of digital fluency. When we think about digital literacy, it is important to think broadly about the many aspects of all things digital. How we engage students, staff, and faculty via digital means requires a thorough understanding of our own digital identity. Working to enhance the digital literacy of students as well as faculty and staff is absolutely critical for digital engagement and identity. You may have noticed that I shared two UK-based resources in this post. That is due to the fact that my wife and I recently moved to the UK. Getting plugged into UK higher education social media channels has been quite enlightening and informing. I’m looking forward to expanding the many resources that I share on a weekly basis on this blog and am excited to connect with the UK higher education community. Join the Future EdTech Event taking place in London on 2-3 June 2015. Do not miss your chance to join 250+ of your peers including 50+ hand-picked speakers in London this June, claim your free pass today. Register your free pass here. There are multiple qualities that make for a good leader. Listening, self-awareness, and a lack of ego are some of my favorite attributes. Those who lead don’t have to be loud or brash or even always right. Leadership is a nuanced path. When it comes to digital leadership, this is where a lot of highly respected leaders don’t always make the leap from brick-and-mortar spaces to digital environs. For 13 years, I have worked in higher education. My career has always been focused around the intersections of technology, communications, and organizational dynamics. Since 2002, I have come to the realization that digital leadership requires three elements in order to be successful: experimentation, learning, and bravery. Experimentation is something that we all have done. As children, we have built imaginary worlds, constructed sand castles, and gotten our hands dirty doing all sorts of wonderfully playful things. Kids experiment as a means of learning new things. When we get to a place in our lives where we identify as adults, some of us lose that spirit of play. Our experimental sandboxes are cast aside as we seek order and routine. To be a successful digital leader means that you’ll always be experimenting. A sense of wonder, trial-and-error, and joy at not always knowing something is required to be a leader in digital spaces. Not knowing things as a leader is okay. However, being open to experimenting AND making time to do it is crucial to figuring out how to be better at your job and to lead those who look to you for guidance and wisdom. Lifelong learning is the only way to truly live. If you’re working in higher education, you’re probably instilling the concept of lifelong learning into your students. The journey of learning is a constant. In digital spaces, the climb towards the top of our technology-mountains is an infinite path. Plus, a willingness to learn new things is how leaders role model a way of being that can send positive ripples through an organizations culture. What you learn today will evolve tomorrow as you add layers of new information that guide your decisions, plans, and strategies. You will always be better off in the future if you keep an open mind to learning new things today. Fear is a tricky thing. It keeps us in a fixed position. Our ability to learn and experiment is often connected to our internal sense of bravery. Being brave doesn’t mean that we’re loud or arrogant. It’s a sense of inner strength that says that it’s okay to not know how a technology works or to be aware of a lack of awareness of all of the latest social media apps. However, bravery makes us secure in the knowledge that we can always go back to our digital sandbox and learn new things. Digital leaders manifest in myriad ways. They are almost always quietly brave, instilled with a spirit of lifelong learning, and engaged in ongoing experiments.